The new Peter Jackson's movie "District 9" is amazing as I mentioned in the earlier post, however, the super late schedule totally messed up this sunny Saturday. And I've been feeling lazy & tired all day long... But Enoch introduced me to a real good Mexican place near Italian Market in S. Philly, and I had a real Mexican imported Coca-Cola, & he had some fancy Mexican domestic soda drink which I don't remember the name of it. Cannot believe that I'm heading off to OHIO Monday morning, PUMP UP & GET READY! 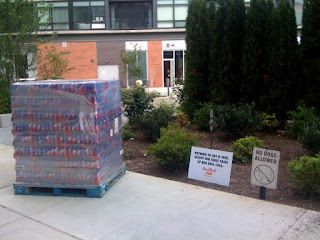 Seriously, this is what I need for the trip...a whole stack of RedBull...pic taken at Northern Liberty Square.